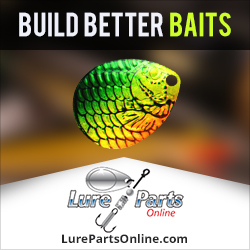 Using pre-made silicone skirts is the absolute easiest way to put a skirt on a jig, spinnerbait or buzzbait. It doesn’t get any easier. But pre-made skirts have some disadvantages and limitations. 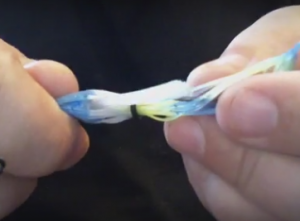 The best thing you can do to make truly custom skirted lures, such as jigs, is to learn how to wire tie a jig skirt. Learning how to wire tie a jig skirt opens up unlimited doors when it comes to the color combinations you can create. It also creates skirts that are much more durable and long-lasting. And it lets you make skirts that won’t come off unless you intentionally remove them. The problem with using the wire tying method is that it’s a bit tricky to get used to. It can be tough to overcome the learning curve if you try to learn it on your own. The best way to learn how to wire tie a jig skirt is to have someone knowledgeable show you how they do it. Why Tie a Skirt with Wire? First of all, why would anyone want to learn how to wire tie a jig skirt if it seems so hard to learn? Why not just use the skirts that come already made? Or why not just use skirt bands to make your skirts? As mentioned above, wire tied skirts give you unlimited options when it comes to color combinations. And creating a skirt using the wire tying method gives you very precise control of how the finished skirt looks. It allows you to place strands of various colors in very specific places in the skirt. Having this much control over the placement of various colors allows you to create near-exact imitations of just about any species of prey or baitfish. 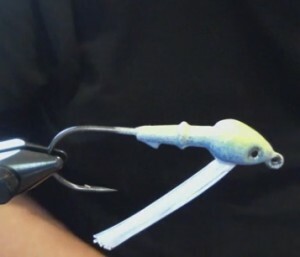 This gives your baits a very natural look, which can help trigger bites in highly-pressured lakes and rivers. The other big reason to wire tie your jig skirts is so they last longer. Silicone and rubber skirt collars are good. But wire tied skirts just last so much longer. Rubber skirt collars are known for drying our after a while. This causes them to crack or stretch. 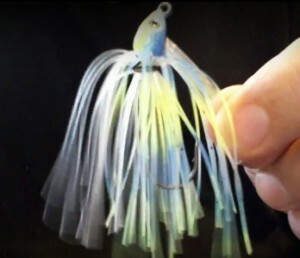 Once this happens, the skirt can come off your jig, spinnerbait or buzzbait with no warning. It’s not uncommon for a skirt to fly apart on a cast or while fighting a fish because the rubber collar became old and tired. Rubber skirt collars can also fall apart while sitting in your tackle box. There’s nothing more frustrating than picking a brand new jig up out of your tackle box and finding the skirt falling apart because the collar dried out. And this can happen to a lure that’s never been fished! Silicone skirt collars are a little more forgiving, since silicone doesn’t dry out as fast as rubber. But it still has limitations when it comes to creating precise color patterns. It’s much more difficult to place various colors in exact locations in a skirt made with a silicone skirt collar. So, there you have it. The case for tying skirts with wire vs. using skirt collars is pretty strong. This is especially true if you want to create precise color patterns or if you’re looking for skirts that just plain last longer. So grab your skirt tabs, your scissors and a handful of jig heads, spinnerbait heads or buzzbait heads and get busy! Here’s the excellent video tutorial. Enjoy! This entry was posted in Making Your Own Skirts and tagged how to make a jig skirt with wire, how to make lure skirts that last longer, how to make lure skirts using wire, how to tie buzzbait skirts with wire, how to tie lure skirts with wire, how to tie spinnerbait skirts with wire, how to wire tie a jig skirt on February 13, 2016 by Lure Parts Online.